Still more on brain cells implanted in mice. Back then, when I first drafted it, the idea of implanting human fetal cells in an animal seemed very far out -- both technically and ethically. And I was advised by early readers -- including some in the New York publishing establishment -- that that idea was "impossible," "out-of-the range of believable, at least for decades." And so on. (1) "Lost in the kerfuffle was the fact that many lab mice are already “chimerized” with a small number of brain cells from human sources, generally far less than 1 percent. These animals could provide important clues to the treatment of serious human diseases and to answer the basic question why human cognitive capacity is so much greater than that of other animals." That piece also touches on some of the ethical concerns: "Would a human-animal chimera have human rights? Could it be patented and owned? What if it were 99.9% human and 0.1% chimpanzee? What of the reverse situation?" (2) Again from the Slate article: "The purpose of the study was not to make [the] mouse perform better in IQ tests but to learn something about the evolution of human cognition." In other words, the aim wasn't to help mice outwit felines, but rather to help science understand how we 2-legged folk think, and learn to think. A post here last week --"Mice given human brain cells become smarter" linked to a piece in Discover Magazine. "To conduct the experiment, the scientists created human chimeric mice — mice that were endowed with human glial cells." "We did this by using a narrow glass micropipette to inject 100,000 human glial progenitor cells into each hemisphere of the developing mouse forebrain," said Goldman. This resulted in the widespread integration of human glia into their brain. Once the mice reached adulthood, a large proportion of their forebrain glia were essentially human. May I intervene here to (modestly) point out that much the same was done by the fictional neurosurgeon/researcher in my technothriller A REMEDY FOR DEATH in his work with Chimp Donnie? "To mitigate any ethical concerns, Goldman told io9 that the grafts were delivered into postnatal animals, they were of cells that could not be transmitted to offspring, and they did not involve neuronal replacement." In other words, they made sure that (a) these "ensmartened" mice weren't going to pass on to their babies, and (b) the implanted human cells were not from an aborted fetus, but rather "from human skin cells reprogrammed into induced pluripotential cells." Which implies that human skin cells can be reprogrammed into brain cells. Hmm, does that mean that when you, as the saying goes, "put your foot in your mouth" you are ultimately adding foot cells to augment the brain-power you just failed to demonstrate by what you said? I wonder. A "chimera" as the term is used in the fields of regenerative medicine, bio-artificial organs, organ regeneration, and others, is a combination of humans and primates (or, now, humans and other animals). So now we have a report via Discover Magazine that human brain cells from an aborted human fetus have now been implanted in mice . . . and it seems "the presence of human cells made the mice's brains function better". Just what that means is still being determined. No reports of whether these mice are smarter than cats. Joking aside, I am very aware of the legal and ethical implications of taking human brain cells and implanting them in a creature of another species. Quite some time back,I started what became my technothriller A REMEDY FOR DEATH with a scene of a neurosurgical researcher planting aborted human brain cells into a chimp to see if that would increase language abilities. This was my fiction, and seemed to be so extreme that it would set up the legal/ethical situation. I wanted to shock, to get readers thinking, This should not be! My agent at the time sent it to some New York publishers, and the most memorable reply came from a well-respected editor who said, in effect, "This is totally impossible." Times have changed. Interestingly, in that Discover piece you'll see some back-and-forth comments by readers on the two related issues of (a) taking cells from aborted / deceased human fetus for the sake of research; and (b) the ethics and implications of moving human brain cells to non-humans, thereby creating chimeras. As one of the characters in A REMEDY FOR DEATH puts it, "You're opening very dangerous doorways! Once they're open, there's no stopping what may come through from the other side!" For some reason (being researched) human stem cells become fewer and less active with age ... except in those certain centenarians. AND also in these polyps, which don’t show signs of aging. The link appears to be that FoxO gene, or some shared commonality around it. 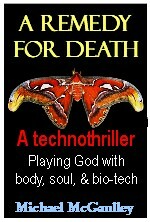 What does this have to do with this blog, and with my technothriller A REMEDY FOR DEATH? I dunno, the article just intrigued me. And at the risk of giving away the plot, I can tell you that there are no freshwater polyps playing a role in the plot of A REMEDY FOR DEATH. Could this immortal hydra polyp inspire advanced rejuvenation therapies for humans? "Humans may not be alone in having insight into the minds of others, a chimpanzee study suggests." You'll find the link to that article in the London Guardian below. London Guardian article: chimps as mind-readers?